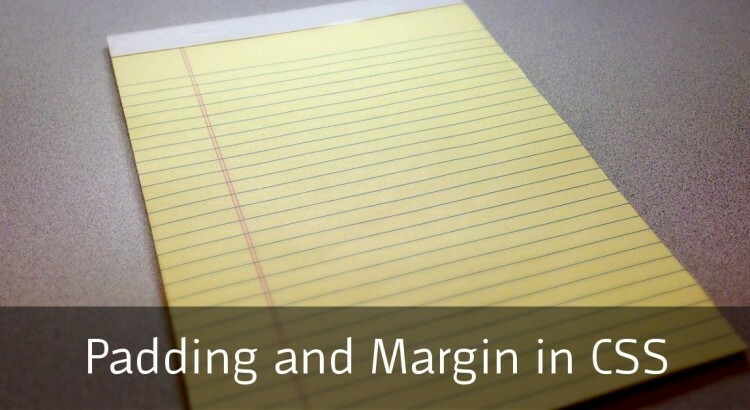 Padding and Margin in CSS - What's The Difference? When considering your web page layout the use of white space really matters. How you space the various elements in your design and how your text is laid out can make the difference between a user-friendly website where people stay, or a cluttered space people jump away from! This is where the concepts of padding and margin in CSS come in. These can be set with any valid measurement: pixels (px), picas (pc), percentage (%), millimeters (mm), centimeters (cm) – etc. By constrast, CSS Margin refers to the space between elements. So here’s our box from earlier, but replicated 3 times and spaced using margin-right. And you can pass 1, 2 or 4 values if you just want to use margin: instead of the specific properties. When creating your page be aware that browsers have hidden ‘default’ padding and margin values. For this reason many CSS grid systems have a good few lines of ‘reset’ code. In our snippet above, we had to set the margin value of the <p> tag, because it had some hidden margins in the browser I was using (Google Chrome in this case). The last principle when dealing with padding and margin is the issue of box sizing. By default, the width and height of all your elements is calculated using the both the padding and the margins of your elements. That can make calculating the size of any ‘wrapping’ element very annoying: every time you adjust the padding, you need to re-calculate the width of any container. box-sizing however ensures that when you set the width of a containing element, that it is honoured, even if you adjust the padding of your ‘child’ elements. Here’s an example without using box-sizing. Although we have set the container to width:650px; our elements don’t fit – the third box drops below the other two. Not cool. This paves the way for us to create a grid system for a whole page layout, but you can see that everything fits now. Even if we were to increase the padding of the square boxes, they don’t overflow the container. You should make good use of padding and margin in order to lay out your page correctly and provide space around all your items. But if you have a containing element you should use box-sizing to have proper control of your layout. If you have any questions, feel free to use the comments!